Lawford Lodge is a beautiful newly built holiday cottage situated in the Scottish countryside overlooking the Ochil and Campsie hills. We have some of the most breathtaking views of the countryside beyond. It is an idyllic place for a relaxing self catering holiday or for a short break in Central Scotland, away from everyday living. Our cottage is suitable for a family, a group of friends or a couple sharing a romantic weekend. The cottage is decorated to a very high standard and there to cater for all your self catering needs. We have three good sized bedrooms; two double and one twin. 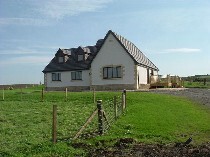 There is a large open plan living area, family bathroom, en suite showerroom, large kitchen and utility room. We have a secluded garden with a decking patio and garden furniture, bbq and childrens play area. There is plenty of wildlife surrounding the cottage and a duck pond which visitors are welcome to look at the many wild birds and ducks. There is also a riding stables nearby where you can book riding lessons. Visitors are also very welcome to take a stroll through the fields and surrounding countryside. We also welcome you to come and see the cows being milked on our new Robotic Milking System which you will find very interesting. There are always calves to see as well and depending on time of year a few lambs. The cottage is well equipped with all kitchen utensils, range cooker, washing machine, microwave, highchair, kitchen linen and an iron and ironing board. All towels and bed linen are also provided. Guests staying one week or more will receive a welcome pack including; fresh milk, eggs, bread, butter and fruit wine and chocolates, all the ingredients for a great self catering holiday in Central Scotland. Electricity is also included. Lawford Lodge is centrally located for Glasgow and Edinburgh airports, twenty minutes from Stirling and there are plenty of local shops nearby, or a short drive to Falkirk town centre.